Just wanted to share a little gift box I made using a sweet template from Creations by AR. A Bottle of Cheer, is an awesome Wine Bottle gift box. You slip off the little tab around the neck and the bottle tops open to reveal a place to tuck a gift or gift card! I used my Cameo Silhouette to cut out the template but it also comes in a PDF format that you can print and hand cut out. It really works up quickly - and what an exciting way to give a gift card or small gift to someone! Paper: Brushed Silver - SU, Tan - Prismatics, DP - Merriment Paper Pad - Tim Holtz. Accessories: Scotch Quick Dry Adhesive, Tinsel Twine - Idea-ology/Tim Holtz, Antique Enamel Dots - My Minds Eye, Silhouette Cameo, A Bottle of Cheer Template - Creations by AR. Welcome all to Adella's Creations by AR October Release. The Design Team is celebrating the release with a blog hop - where you will find unlimited inspiration for using these wonderful new templates. 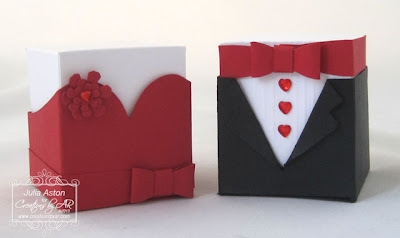 The templates are called Card Armoire and Fragrance Bottle Set. The armoire is a wonderful little wardrobe container big enough so that you can use it to store your stash of cards in (or many other things as well!) There are two fragrance bottles in the 2nd template - one a more masculine style and one feminine. They open to reveal a little compartment where you can put a gift card or small gift item! I've got lots of photos to share so you can see all views of these creatively designed new templates. I decided to go very vintage in my design - and did that by using papers from Tim Holtz Idea-ology Paperstash Crowded Attic and Destinations. Here's the front view of the armoire with the doors closed. The top piece lifts up (hinged on the back) to release the tops of the doors so you can open the armoire. I placed 5 cards with envelopes inside my armoire - and there is still room for about 5 more! Here's the view from the back - nice and finished off! and a close up of the handles - I used two Hitch Fasteners from Idea-ology - I had just purchased them at Joann's a week or so ago - and they were perfect for my door nobs! Today I just made the masculine style fragrance bottle to go with my masculine armoire. There is a feminine style in the template package as well which I'm sure you will find a sample of on other of the DT's blog posts. I used a Word Band from Idea-ology that I first dabbed with Ranger Scattered Straw Distress Paint - heated with my heat tool to dry and then dabbed it with Antiqued Bronze Distress Paint and heated again - it left this wonderful rusted look. I looped a piece of Idea-ology Linen Ribbon through the ends and pulled apart the ends of ribbon - I love how much texture you get when you pull the ends. I had also inked the ribbon with Vintage Photo Distress Ink. Now the sentiment engraved on this Word Band says "life is about creating yourself" but I just noticed that the 'cr' in creating doesn't show as clearly as the other letters so that makes it a rather odd sentiment! I think I'll scrape it a little so the cr shows up better before giving this to someone!! The template also includes a piece to slip inside the box that has a slot so you can use it for a gift card. 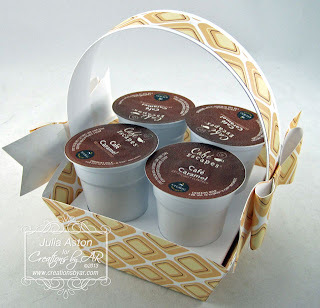 Or you don't have to put that piece in and you can use the box for a small gift! I hope I have inspired you with my vintage creations. For more inspiration please check out the rest of the Design Teams blogs linked below! 3. Julia Aston: - Me! Accessories: Ranger Distress Paint - Scattered Straw and Antiqued Bronze, Word Bands and Linen Ribbon - Idea-ology/Tim Holtz, Template - Creations by AR, Silhouette Cameo, Scotch Quick Dry Adhesive. 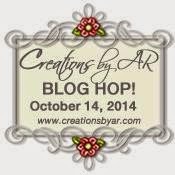 Welcome to the Creations by AR September Template Release Design Team Blog Hop! Adela has designed 3 wonderful winter gift boxes - Gingerbread Gift Bag, Starry Tree and Stack a Snowman! 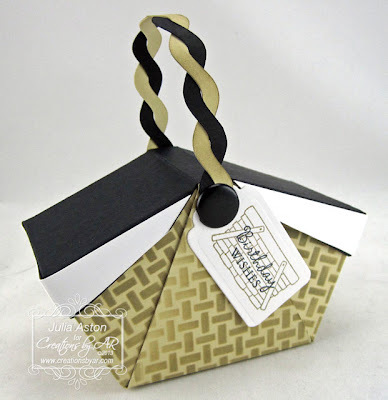 Here's my version of the Gingerbread Gift Bag - I decided to make it out of a piece of patterned paper from the Idea-ology Paperstash Wallflower paperpad. 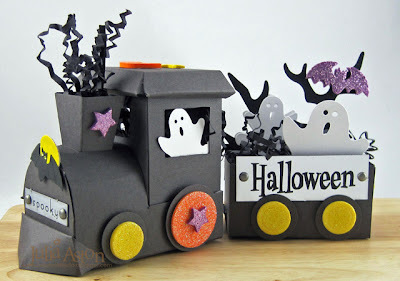 I also used some Bazzill solid color papers for the trims, lollipops and gingerbread boy and girl. I also substituted the small wreath that comes with this template with the larger wreath and bow that comes with the Stack a Snowman template that you will see below! Here's a close up of the trimmings - I used a Sakura Black Glaze pen to draw the details on the Gingerbread people and added rhinestones to the lollipop centers and doorknob. I made 3 little Starry Trees - one for each of the sentiments - mixing up various greens and browns of Coredinations Color Core and Kraft Core papers - I sanded each piece to make them look weathered and folksy - I coordinated them by using the same color for the banners and gold paper for the sentiments and stars. Here's how the boxes look with the tops lifted off - to reveal the 'tree trunk' box where you can place a small gift or candy treat! I used the star cut out version for the top of this tree. I love the look of the mix of colors on my trees. This shows how the 'trunk' opens. After you fill the box - you just pull in the sides and slip the top of the tree over it - how easy is that?!! This is the same wreath I used on my Gingerbread cottage above. I put home made green enamel dots on the bow and wreath. Look how cleverly his hands hold the wreath! I used rhinestones for his eyes, nose and mouth and tied a long piece of wrinkled seam tape around his neck. And here he is all opened up - you can put treats in his head, his middle and his bottom (!). 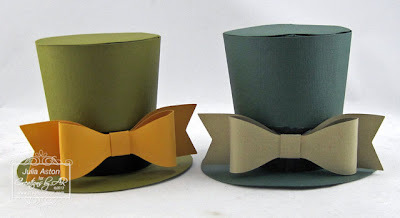 And look at that cute hat - that's my favorite piece! Adela is also offering a Discounted 2014 Winter Bundle you save $3 when you buy all three templates! PRIZE: One of these new templates. Three random commenters will be chosen from the designers' blogs and Creations by AR Face Book Page and will win one of the new templates. 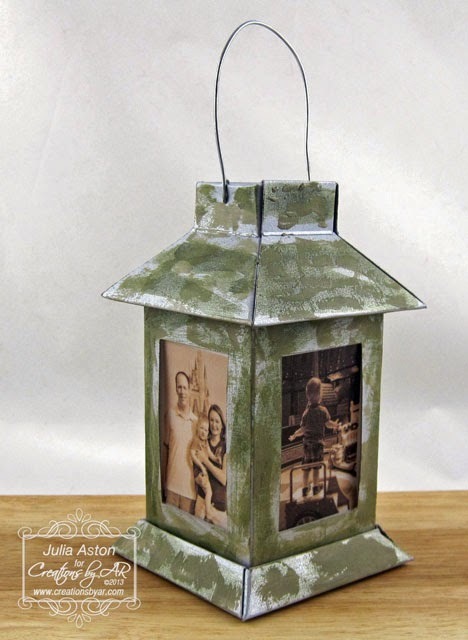 Leave comments on each designers' blog linked below and/or Creations by AR FB Page. The more comments left, the better chance of being chosen. 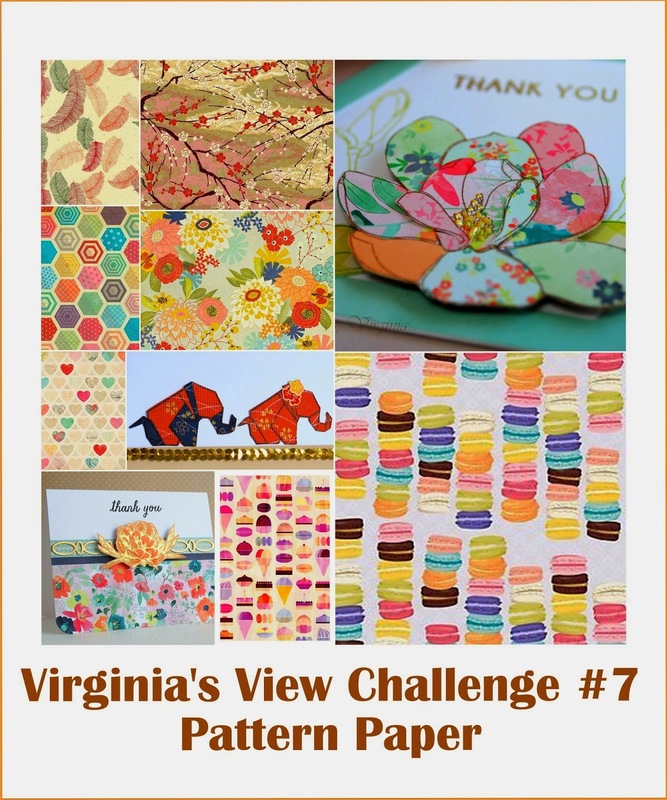 Here are the links to the Design Team participating in today's Blog Hop.